Although I usually spend at least an hour every day reading the news, it has been years since I have held a newspaper in my hands. But my son-in-law Emile, and his father, my friend Henry LaFargue, like to sit and “read the newspapers.” They are stacked up on the kitchen table: The New York Times, The Wall Street Journal, The Star Ledger. The New York Times and The Wall Street Journal are American Institutions. In particular, they are capitalist institutions. They are purveyors of American values and ideas. Quite specifically, they are New York City institutions. If one is a New Yorker of a certain station, with a certain educational background and certain cultural proclivities, one defines one’s self in relation to these publications. For these people, these newspapers are part of their daily and particularly, their Sunday rituals. On Sunday, after a run in the park or a walk with the dog, one stops by a newsstand to pick up the Times, then goes to a gourmet, specialty, super duper coffee shop gets a large cardboard cup of coffee, and after that, if one is truly a New Yorker, by a bakery to get some of the bread that defines New York: bagels. Bagels are like little fat tires made of dough; they are boiled and then baked, and then seasoned or flavored: there are sesame bagels, blueberry bagels, garlic bagels, onion bagels, etc. If one doesn’t eat bagels, especially on Sunday, diet or no diet, one cannot be considered a true New Yorker. And as anyone in the world will tell you, it is very important to be considered a true New Yorker: as important as being considered a true Parisian or a true Londoner…not an immigrant or a transient, but a citizen by birth. Then it is home, to spend several leisurely hours reading the Sunday Times. The Sunday Times can sometimes weigh a kilo, and reading it is no frivolous task. The two most important parts of the Sunday Times are the Magazine section and TheNew York Times Review of Books. These two sections will provide one with hours of fodder for conversation in which one will posit oneself as well-informed person. What is happening on the brilliant cultural scene of New York is also of interest. The international news, the local news, the real estate news, the financial news, the social news, are also there. To read The Times is to be well informed. The Wall Street Journal is the Wall Street Journal. It is a must read for anyone who is in any way involved with the American stock or bond market. For others it is not so important; certainly not as important as the Times. 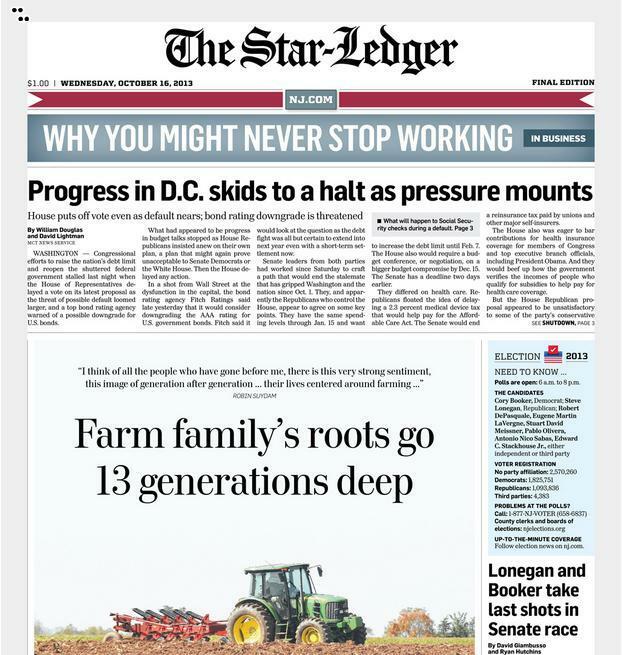 But The Star Ledger is another matter altogether. It used to be called The Newark Star Ledger and it is a local paper aimed at the rich and poor masses who read newspapers (and that far from everyone) in the communities surrounding Newark. Newark is an old town, founded in 1666 by Puritans. This fact is reflected in the name of the city itself which was named “New Ark” for the “New Ark of the Covenant”. It was a Puritan dominated theocratic city, until, like so many other of the Puritan colonies, the hold of Puritanism was broken as people turned away from their strict control. Over time Newark would become a thriving shipping, manufacturing and industrial center which absorbed generations of immigrants. However, for whatever reasons, and there were many, Newark went into decline after WWII. It is interesting to note that that it went into decline almost simultaneously with the decline of unions and with the conscious and deliberate dismantling of Roosevelt Era policies aimed at helping the poor and working classes. Soon, Newark would become a rundown holding pen for Afro Americans who had fled segregation and brutality in the Southern States only to find themselves segregated and brutalized in the North. On July 12, 1967, a final act of brutality proved to be the straw that would “break the camel’s back” of African American passivity. A taxi driver named John Smith was violently injured while being arrested. Crowds gathered and what were then called “The Newark Riots.” began. At first small, they grew in number and size. In the end 26 people were killed, 1,500 wounded and 1,600 arrested. During those days of rage, the city burned, and businesses were destroyed… There is a film Revolution ’67 that deals with these riots. Newark would set the pattern for the riots that would spread through American in the coming years, riots that portended revolution as white people too began to rise. It was, in my lifetime, the closest America would come to being torn apart by Americans. Until very recently Newark would be left to rot. In 1969 I got one of my first teaching jobs at the Rutgers, Newark campus. I would teach there only one semester because I was just too afraid to walk from my car to the classroom. That’s how dangerous Newark had become. Last week I took a bus trip from Hackensack, a city in Bergen county, to Newark’s Penn Station. I could not believe it was Newark: it was shining and clean and beautiful. Newark has been reborn…or has it. The front page of the Star-Ledger tells me otherwise: If New Ark has survived the flood of decay and decline, New Jersey has not. One the front page of the July 27th edition is the picture of a Sikh man in a suit and turban who, as it turns out is the State Attorney General. The article is about the racial slurs that have been directed against him. Next to it is an article about the rising number of deaths from drug overdoses that plague New Jersey. Every county of New Jersey. There is an article about an Ex Newark Archbishop who was reprimanded and forced to resign following allegations of pedophilia. A story about the scammers who “swindled consumers out of small fortunes” and how the state finds itself powerless to recoup the money for the people. There is yet another article about how a health provider “skewed quality and costs” on a new plan. This is the news that arises from local newspapers; not news about Putin, not a detailed explanation of the political situation in Kashmir, not the latest books and hottest plays, not the fanciest restaurants and best clubs, but the news about the decline and fall of a nation plagued by an opiate crisis, torn by racism, impoverished and taken advantage of by unscrupulous capitalists large and small, a nation degraded by sexual immorality of the worst sort – pedophilia. How is it possible that Newark rises and shines as New Jersey, and so as America, enters a new stage of human degradation? It is not.